Even in the midst of a busy wedding season, a styled shoot is an opportunity for a group of wedding industry suppliers; bridal boutique, makeup artist, hair stylist, florist, venue and of course a photographer to collaborate on a project that is dedicated to our creative minds. It’s our way of keeping fresh, experimenting with new ideas, creating original imagery for our marketing and developing strong networks within the wedding industry. 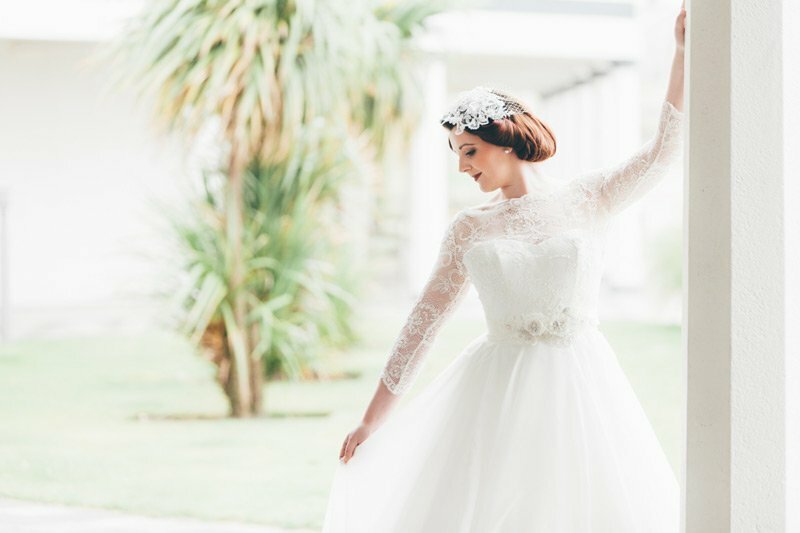 I exhibited at a wedding fayre at Marine Hall decided it would be a great venue to hold a styled wedding shoot, with such gorgeous grounds it would give us lots of options for different looks. There is the beautiful Art Deco designed building with its domed roof over the ballroom, the sweeping lawns and let’s not forget the location; it’s right next to the beach! 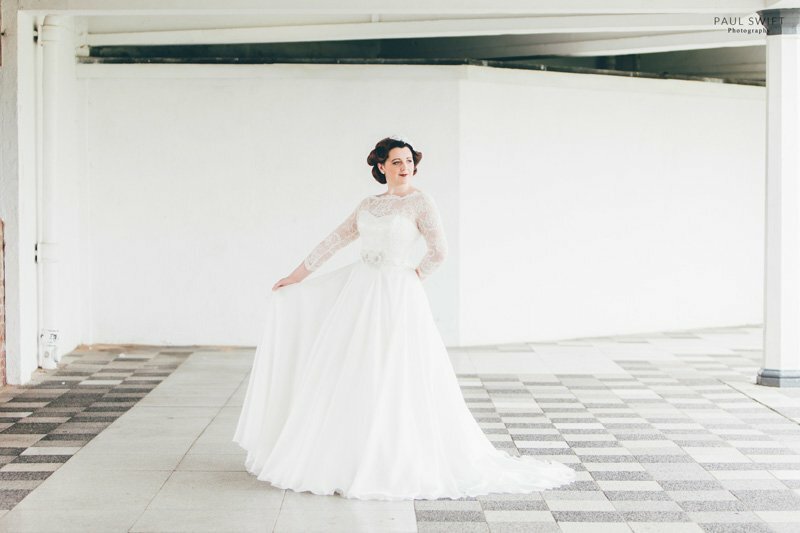 The asymmetric bodice of the dress was contemporary and striking from both the front and the back, the full skirt was a dream to work with – light and romantic and the beautiful crystal design on the waistline was the perfect eye-catching detail. ‘Bellisima’ by Caroline Castigliano with lace jacket also from Caroline Castigliano and a belt from Richard Designs along with the headdress from Emmerling. The nipped in waist and full skirt are very indicative of the 1940’s and the lace bodice finished it off perfectly. This floor length gown is elegant with beautiful beaded sleeves and bodice, with skirt of lace over tulle and charmeuse. The romantic vintage look is finished with delicate beading to the floral lace hem. The look was added to later in the shoot by adding a feather wrap by Sasso. The next thing I needed was a vision for the shoot and after a few hours on Pinterest decided to go for three separate looks. This would require three dresses with changes of makeup, hair and flowers to suit. I wanted 3 quite different options so considered a 20’s theme to compliment Marine Hall of course! Then more of a vintage 40’s inspired look as well as something more contemporary. From here I carefully selected a team of experts from each area of the industry to get together to work with. A lot of time and research went into this to make sure each was the right fit for each other and luckily they were all willing to join me. The dresses came from the award winning Dreamcatchers of Kirkham. I researched a lot of bridal boutiques all over Lancashire, but when I viewed Dreamcatchers website I was sold. 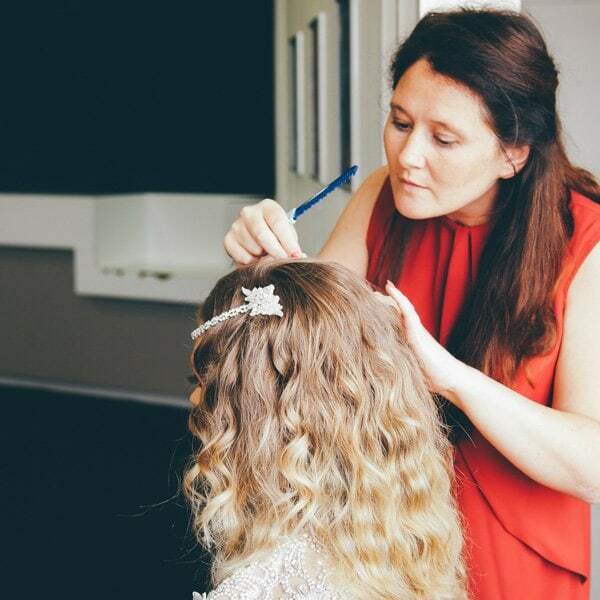 It’s a family run business, Gill and Georgina – mother and daughter; having been established for 15 years they have a wealth of experience between them. Not only do they stock some of my personal favourite dress designers including Caroline Castigliano, Anny Lin, Enzoani and Sassi Holford, they have a wider selection of gorgeous dresses to choose from, all from amazing designers. I visited the boutique with one of our models, Carla to choose the dresses that the boutique owners and I really thought would feature well with our themes. The boutique is stunning and it was great to work with such experts in their field. 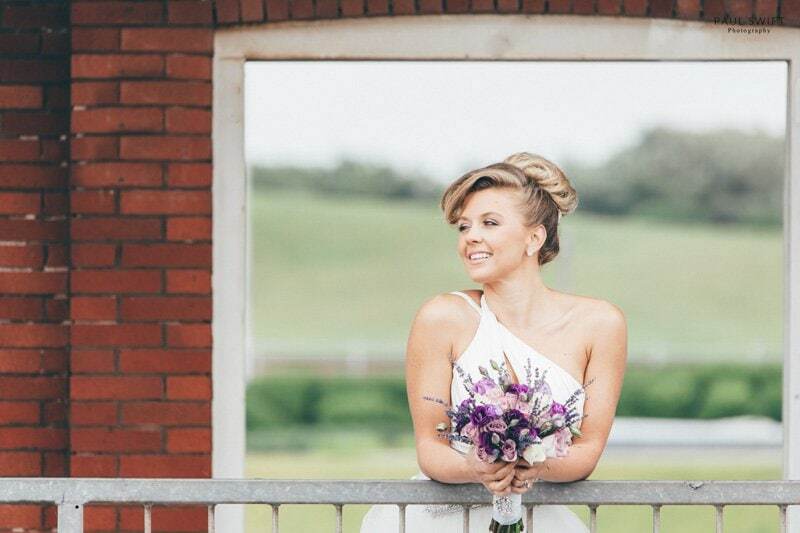 Hair was styled by Clare Osbourne of Beloved Bridal Hair. I actually met Clare during the wedding fayre at Marine Hall and immediately knew I wanted her on the team. Clare is a really lovely lady and certainly knows how to dress hair. She has a wealth of knowledge and can confidently deliver anything you ask of her. Makeup was provided by another award winner; Sonara Parker. I only needed to view Sonara’s website to know I wanted her onboard. Her personality is evident all over her website and her work is of an exceptionally high standard. 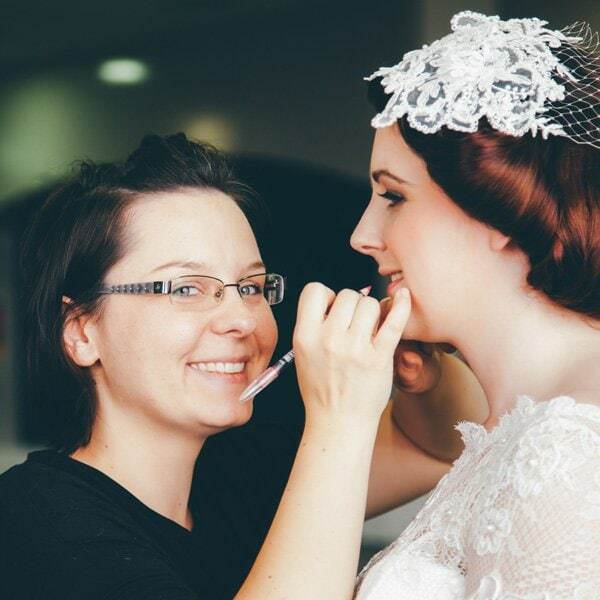 Sonara has over 9 years’ experience in the wedding industry along with years of work and a keen interest in theatre and fashion. Sonara also brought along with her Alicja Krupa, a young makeup artist, new on the scene but really talented, to gain some experience. Flowers and styling was by Fabulous flowers by Kate. Kate was recommended to me and from the moment I spoke with her I knew she would be fabulous. Kate has over 10 year experience within the industry and it really shows. 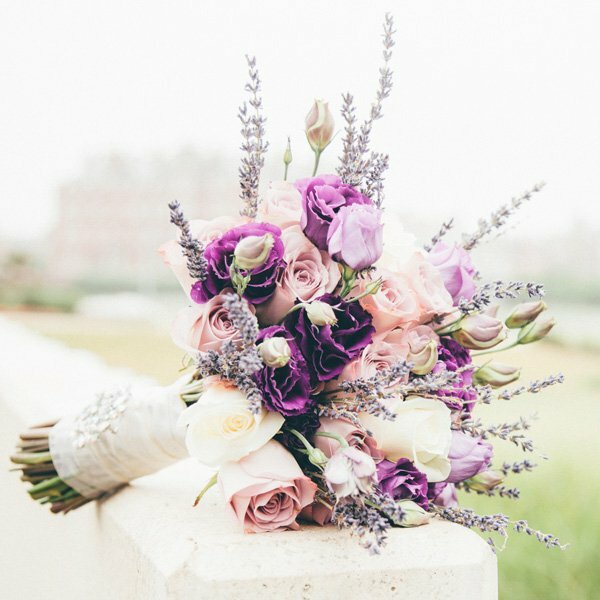 The bouquets Kate brought to the shoot were out of this world. I also asked Kate if she would like to add a little style to the venue and maybe set up a table design. She was very keen to add this element into the shoot, even small, simple details like this add an extra dimension to the shoot for me.